How to get there: NOTE: Since this mountain is within a military area, you may want to call ahead to Akkaseter and check if climbing is permitted on the day in question. From Tromsø, head south on Hwy. E8, then E6 to the small place Olsborg which is 122 kilometer from Tromsø. Olsborg is 12 kilometer north of Bardufoss along Hwy. E6. In Olsborg, take Hwy. 854 north a few kilometer to Kjellmoen. Here, a road goes right towards Aursfjordbotn. Take this road another few kilometer and look for a signed road going right to Akkaseter. Follow this road, which turns into a (good) gravel road to Akkaseter. Akkaseter is the natural trailhead, located at elevation 165 meter, north 69:11.094, east 018:41.877. The entire Blåtindan mountain is within a military firing range, Akkaseter is the military headquarter for this operation. You must stop and check with the commanding officer about climbing this peak. He can advise you on parking at Akkaseter and what route to follow on the mountain. Route description: We continued a short section along the dirt road (closed to civilian traffic) that heads higher up towards the mountain, then left the road and skied fairly steeply up to the main ridge above. 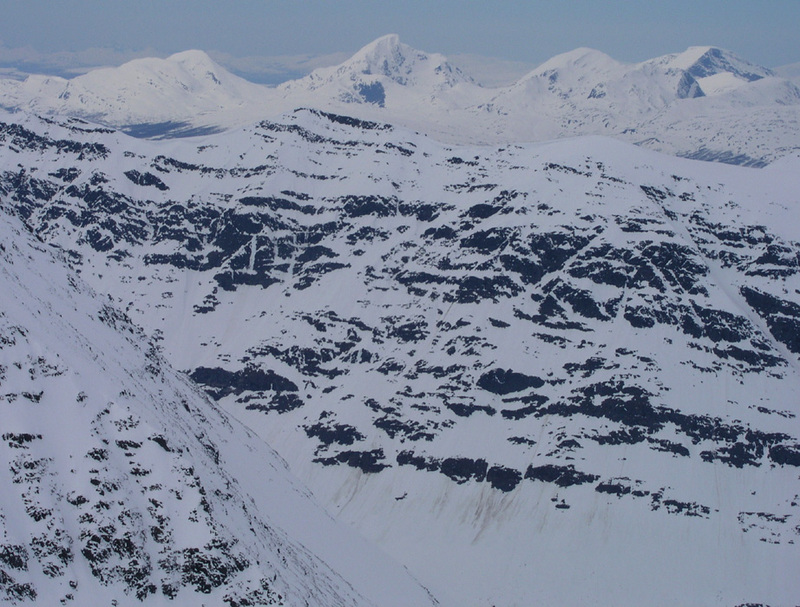 There is a saddle between Skardaksla and Skardfjellet at about 730 meter. From here, follow the broad ridge northeast, then curving east towards the summit. The slope becomes a bit steeper as you get above 1000 meter, but never difficult. 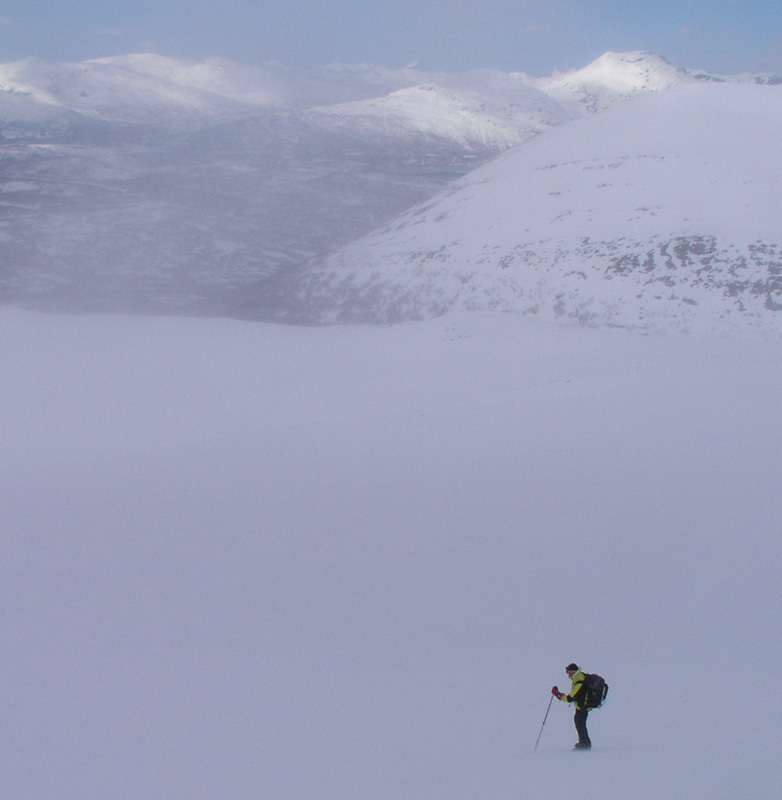 This route was measured to 5.6 kilometer one way, from Akkaseter to the summit. Comments: I did this climb with my friend Ståle Grimen. The conditions were far from perfect. 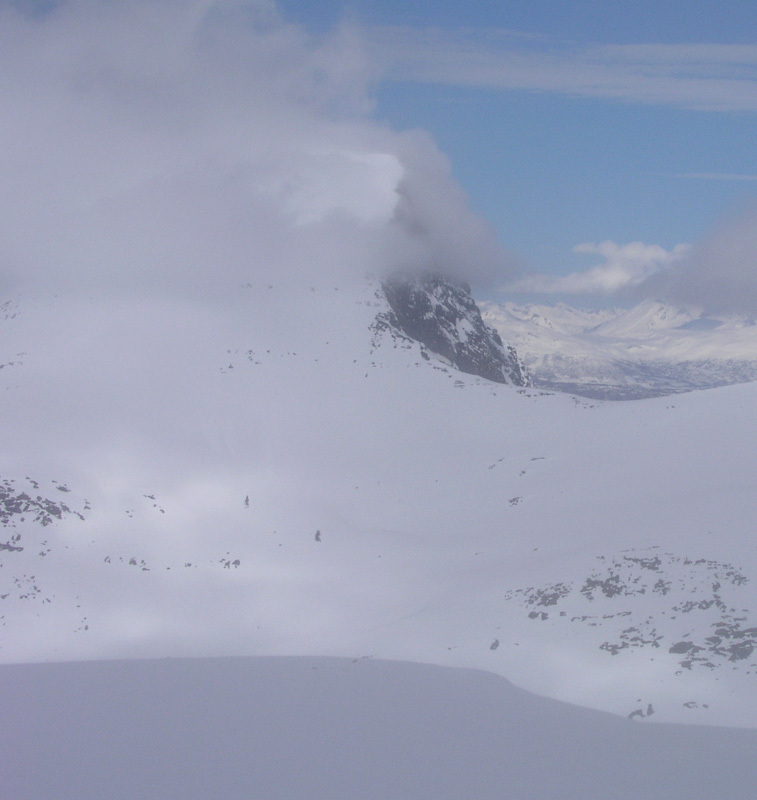 Already at Akkaseter, the wind was quite strong, but patches of blue sky were visible and one could see up to Skardfjellet. Higher up, the wind was storm force, a struggle to advance and keep your balance. The peak itself completely hidden in dense clouds. We left the skis at about 850 meter, tied down to big rocks to prevent them from blowing away. The peak was then climbed in dense fog with no visibility at all. 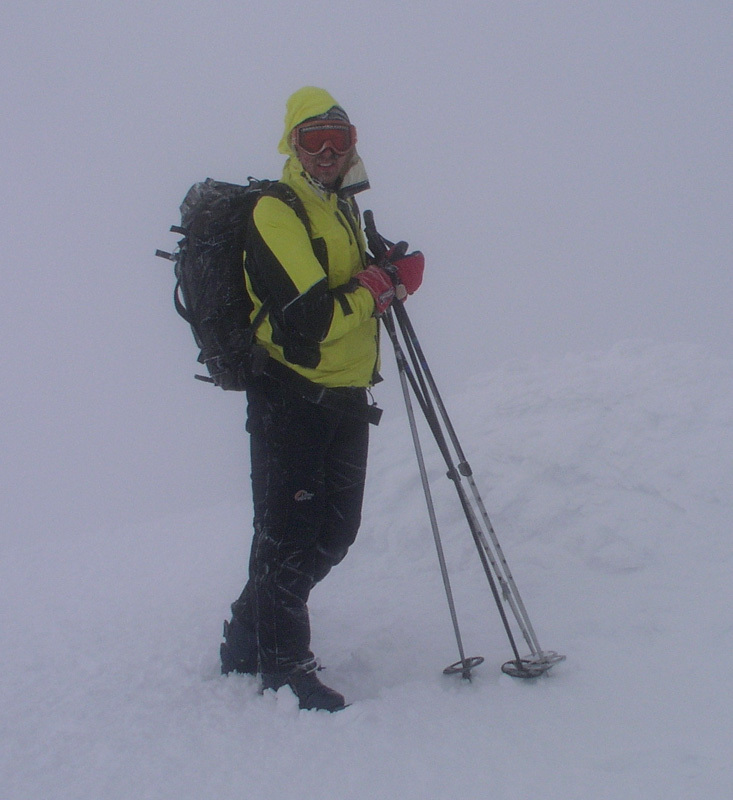 Fortunately, the wind was less violent on the higher ridge including the summit. We started from Akkaseter at 0730, hit the summit at 1130 and returned down to Akkaseter at 1300. This was peak number 4 in my T5 trip. Next peak Rohkunborri. Previous peak Hjerttinden. Blåtindan (in the middle) as seen from Lille Russetind. Ståle at the summit. The weather was bad and visibility was zero. There are huge drops nearby. Below the clouds, a brief view back where we just descended. Ståle skiing on the lower slopes. Leirtinden is visible with much better weather than here.